Rebecca and Mike, it looks amazing! I love the colors you chose, and believe me, I know all about neurotic taping. Excellent job! Oh my gosh! You two have way more patience than I do! It looks great though. Nice job! Hi, I’m linking over from The Lettered Cottage. This turned out great. Such patience! Thanks for showing us how it’s done. Beautiful. 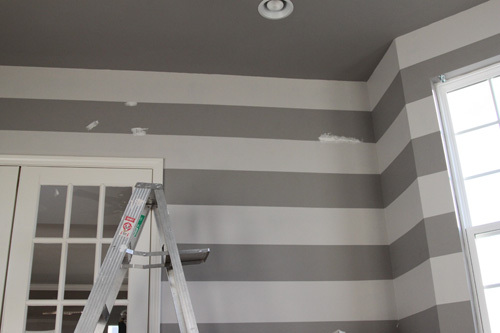 I want a striped room so bad but the crazy amount of time getting the stripes just right makes me cringe to think about! Wow, that looks GREAT! And talk about a walkthrough, you guys did a great job. When the picture came up of Mike taking the tape off, I was a bit squeemish because I wanted it to look grand~! The darkness of the paint actually looks really good! 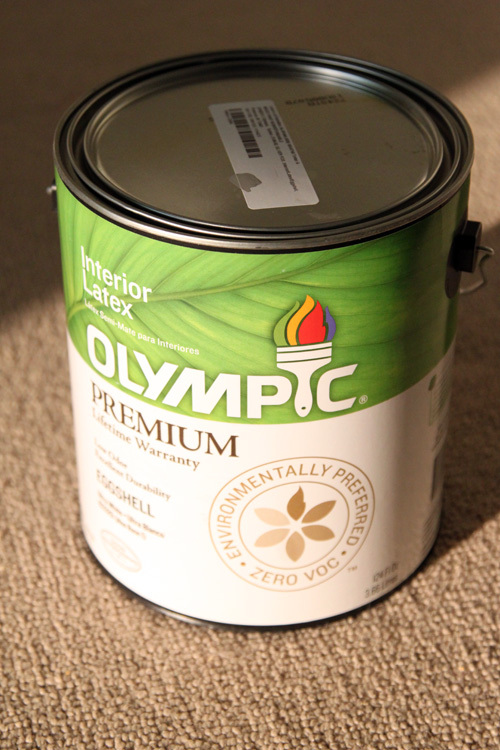 Were you worried it was going to make the room really dark? Thanks! I think a small room would be much easier to do! 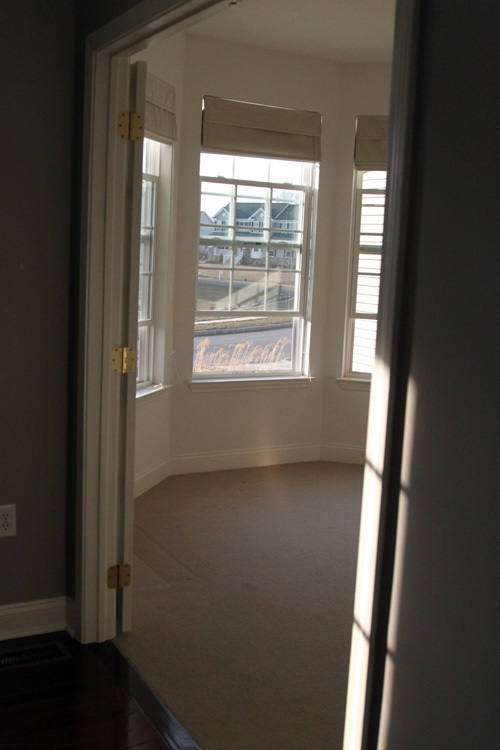 Our office is about 11’x11′ with the french doors and bay windows, so it was a lot of work. But seeing the end result made us all giddy! 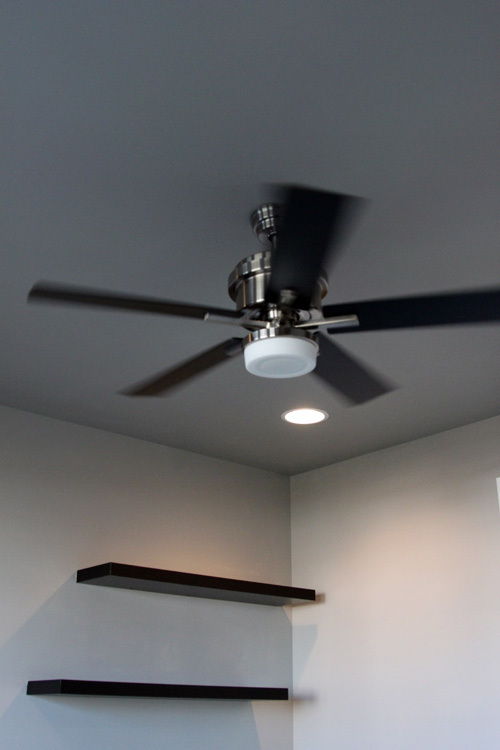 Well done – this room looks great! 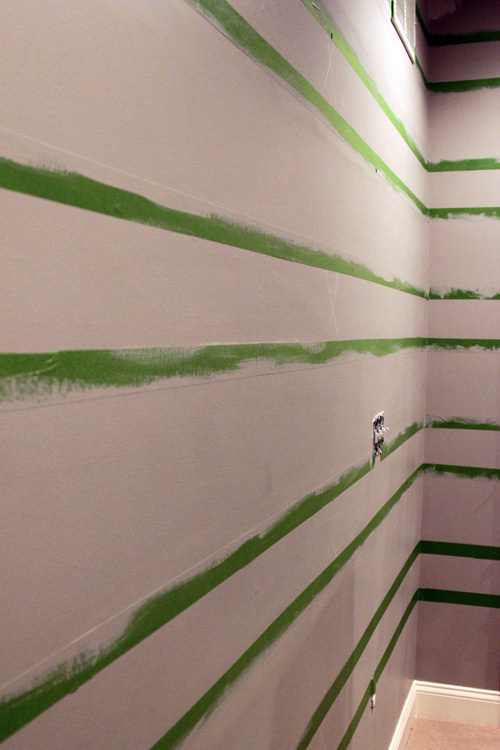 We’ve haven’t had luck with frog tape and had to make several repairs when we worked with it. We had a handful of areas that needed to be repaired, but nothing too crazy. I think had we used the typical blue tape, we would have ran into more problems. Love it! 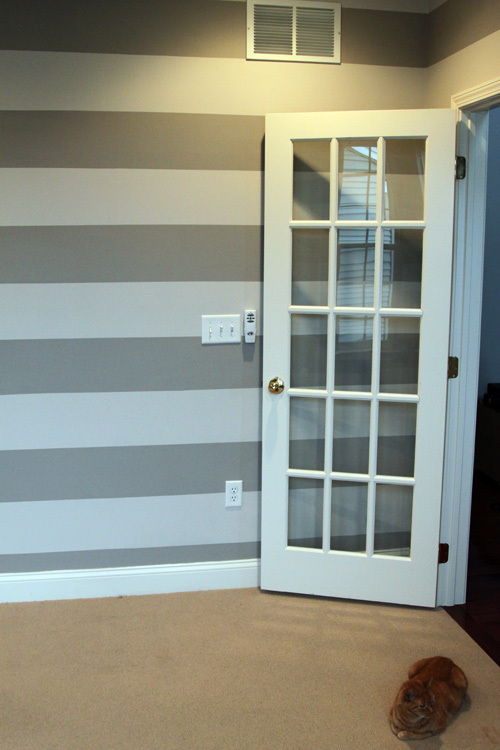 (I’m here from the Lettered Cottage) We did stripes in our office/guest room too. Except we didn’t do the ‘lighter color first trick’ we did the glaze trick and it didn’t really work as well. Haha, well, we _thought_ we were doing the ‘lighter color first trick’ until we were halfway done and realized our light color was actually too dark. So mid-painting we switched it up a bit. What a fabulous job! It looks amazing, great color selection. 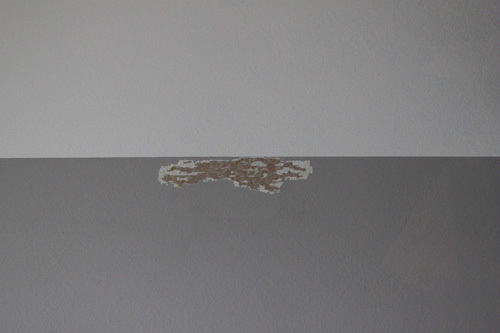 We did this to our guest room in November with the same technique. I especially love the painted ceiling, it brings the look all together. Thanks Jessica! 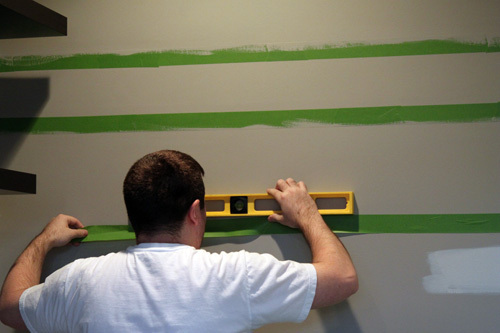 Your stripes are awesome and I wish I read about your measuring method before we started! We originally attempted a laser level and wasted some time fiddling with it before we realized it wasn’t going to work. HAHA at “My husband is a creative soul at heart. He just pretends he has no patience, so I had to squeeze it out of him by providing snacks”! That totally sums up my life. It looks beautiful!!! 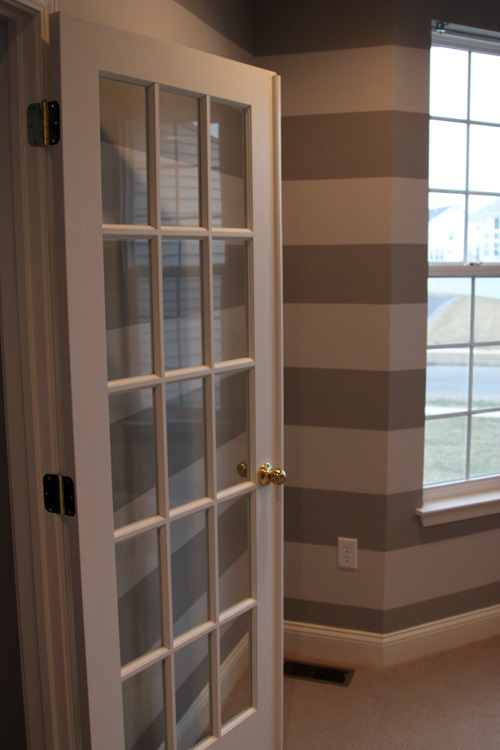 The lines look perfect and I love that you have french doors, it makes the entire space even more dramatic and polished. Thanks Lauren! The french doors are probably my favorite part of the house 🙂 We’re looking forward to finally getting rid of the gold knobs on them so they will look so much classier! Haha! I was nervous, but we were fine. I think if it was 10pm and those stripes didn’t come off clean we’d be singing a different tune right now! LOVE the stripes!!! What a fabulous job – so inspiring! And I agree, painted ceilings make such a difference. If I didn’t have the crappy popcorn stuff – I’d be painting mine too! Kudos on a job well done! are you obsessed? I so am! 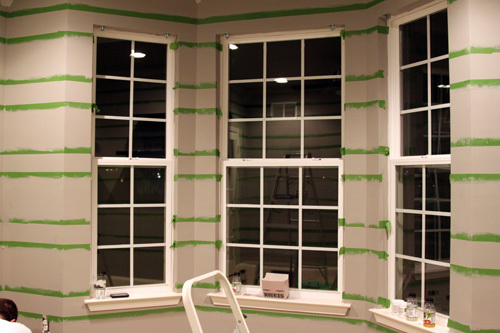 When you get a house, I’ll be there with tape in hand! We’re really happy with it, it’s a good natural high feeling to accomplish something like this in such a short time! Girl! Those look AMAZING!!! I am super impressed. I wish you could come do some stripes for me. 🙂 Great colors too! 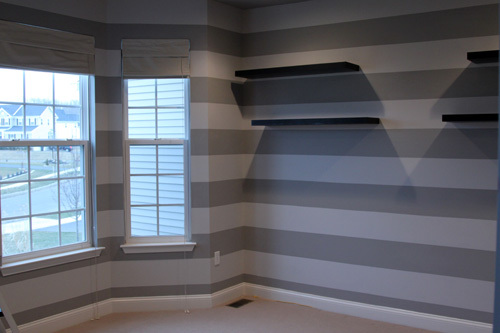 Looks great–love the gray and white! 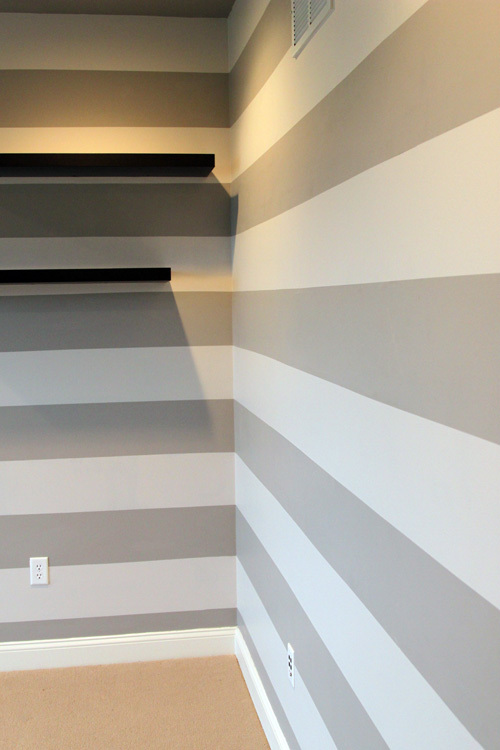 I’ve had stripes on my mind, too, since buying our house. Gray is my color of choice, as well! Thanks! Just lately I’ve been leaning gray. I tried some more beigey colors for our bedroom when I finally accepted that I’m going gray! 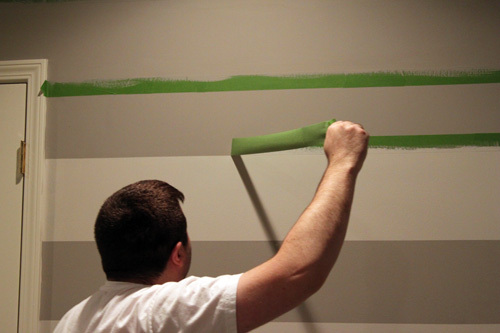 Love wall stripes and that color is awesome! Such a good job! Love the stripes! 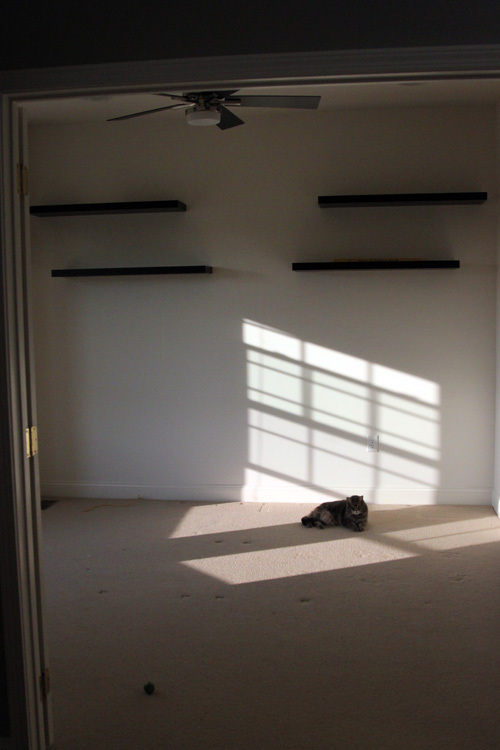 I’m inspired to paint my soon-to-be-office. 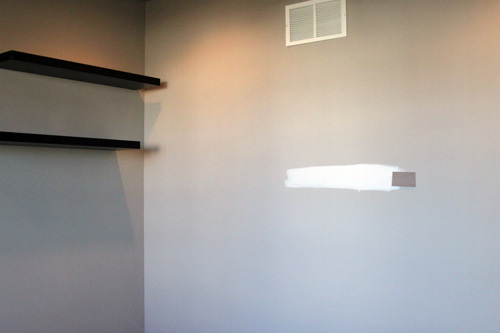 The room currently has a chair molding about half way up the wall. 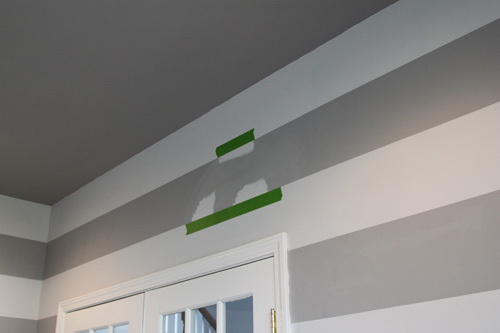 What do you think about painting the stripes above the molding and the darker color below? Or, should the lighter color be below? It’s a small room with only one window. I think you should paint the strips vertically since you have the chair rail it would look just great as long and the color under the chair rail remains a solid color. Good luck with your project, I would love to know how it turned out. OMG! I am the SAME WAY!!! I got the urge on a Thursday and Ordy and I taped it up on a Friday (also perfectionists, but the room wasn’t nearly as large!!) and finished it on Saturday!! 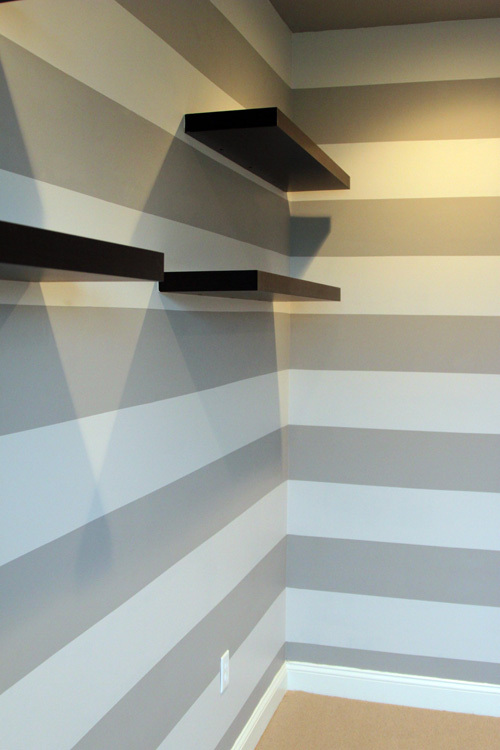 Same stripes (and bookshelves!) in my office! Love the space you have and the colors you chose! Oh I like your stripes and that sure is a gorgeous shade of grey! 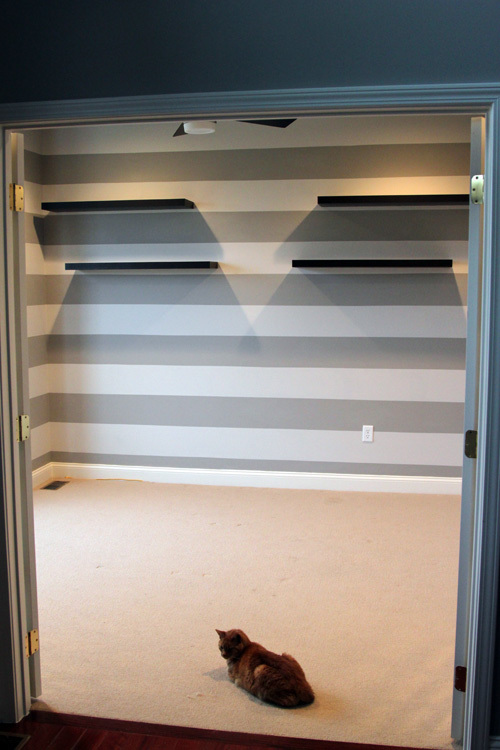 I linked this to my stripes project post too today, for inspiration! 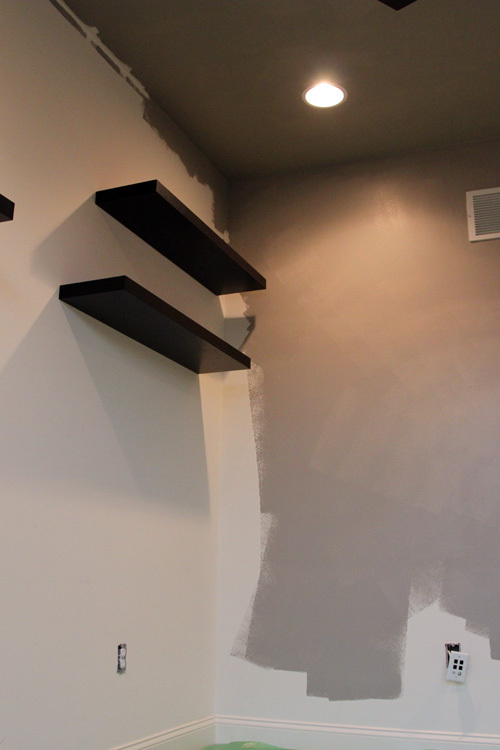 Went with Valspar “Woodlawn Colonial Gray” looks awesome. 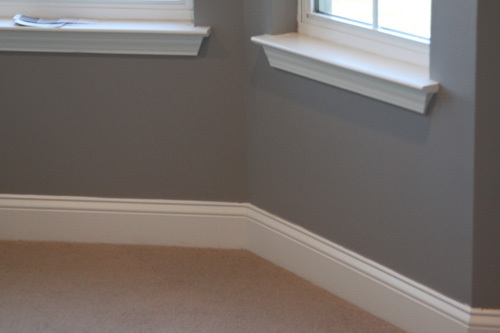 We ended up going with Benjamin Moore’s Silver Fox (color matched to Olympic’s no-VOC paint) for the darker color and Olympic’s Gray Ghost for the lighter color. I wouldn’t say it’s purple, but a pretty dark gray! my presentation focus, ?hich i ?m going to convey ?n school. creating new web site or even a weblog from start go to (twitter.com) end. copper, steel, polyvinyl chloride (PVC), and chlorinated polyvinyl chloride (CPVC). 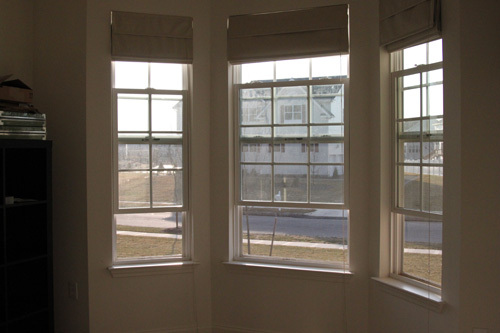 overlook conversion techniques, and at ForceFive Media we can not envision why. I like the idea of this wall, it gives new dimension to the room. Thank you for sharing your wonderful project of yours. I will definitely try this using different colors. it and also added in your RSS feeds, so when I have time I will be back to read a great deal more, Please do keep up the great work. 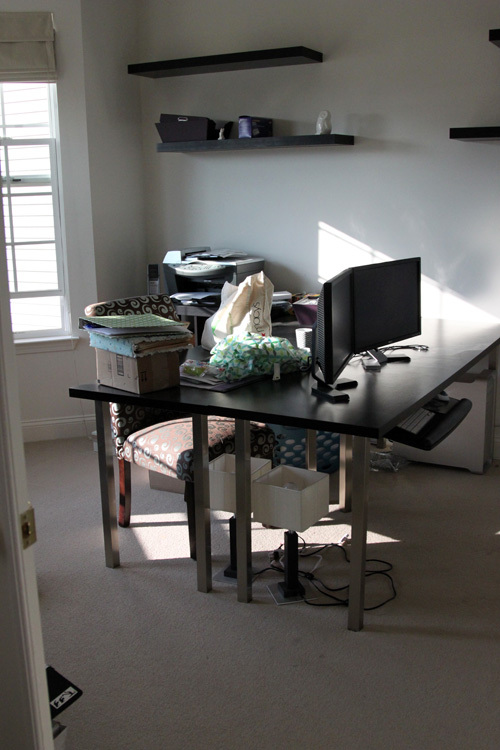 Thanks for finally writing about > The Office Stripes | the lil house that could < Liked it! I’m looking forward for your next post##I used to pay a visit this weblog daily. Ohh my God! You guys are a great artist I can say. Your patience, color choice, especially that white stripes added a unique look. Really want to try it out for my office too. How much time does the whole process take? It is in reality a nice and useful piece of information. I’m happy that you just shared this helpful information with us. This is truly outstanding and faultless article I have scrutinized regarding this matter. Much esteemed and tops off to the maker. Acclaim to your composed work aptitudes. ??? ?Cartier ????????????????????????????????????????????? ??????????????????????????????????????? ?http://kidying.com/ ??? ?? ????????????????????????????????? Nice article! i really liked this article. in case, if you need more help. you may visit our website and follow the instructions to fix the problem.